I’m sure Christmas shopping used to involve simply exchanging hard cash for manufactured items. Some of which were gracefully received; others relegated to a pile of goods to be taken to the charity shop, or passed on to more grateful households over the course of the new year. But either my perspective has changed since I started Our Time of Gifts, or there’s been a subtle shift in the way spending is presented. This year, it often seems to be accompanied by encouragement to give something away to those who are less fortunate. Take this week’s shopping trip with Austin and Gwen, for instance. 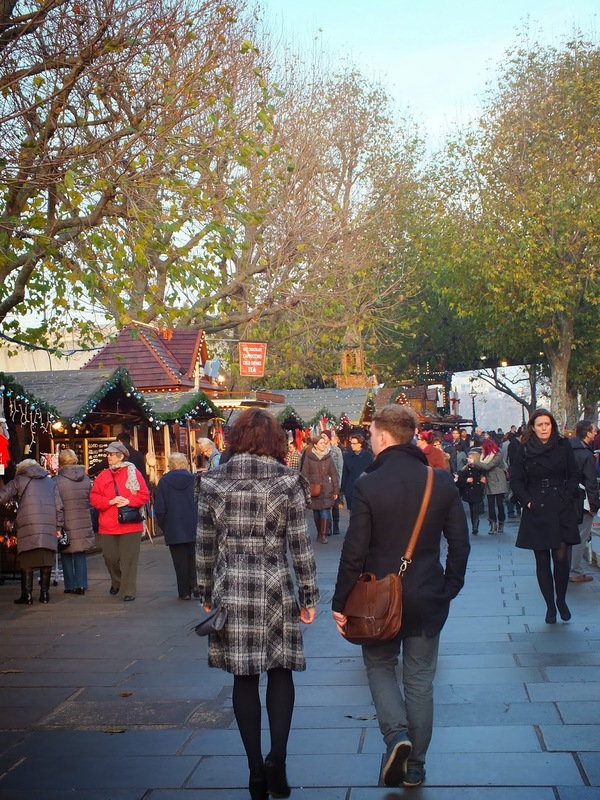 I decided to take them to the South Bank, to pick up some last-minute presents. And, as well as the obligatory German-style market, which sold aromatic mulled wine; tangy, flavoured cheeses from Snowdonia; snuggly scarves and an array of retro pocket watches; we also visited parts of the South Bank’s Alternative Gift Guide, a range of different ways to get involved with helping out people in need at Christmas time. Regular followers of this blog will know that – for almost six months – I have been giving something away each week. My gift this time around was a winter coat I no longer wear, which I donated through Bernadette Russell’s installation Coat Tales, part of the Alternative Gift Guide. It runs until 6 January, and the idea is that you take along a coat, with a handwritten note to the next person your garment will be keeping warm. 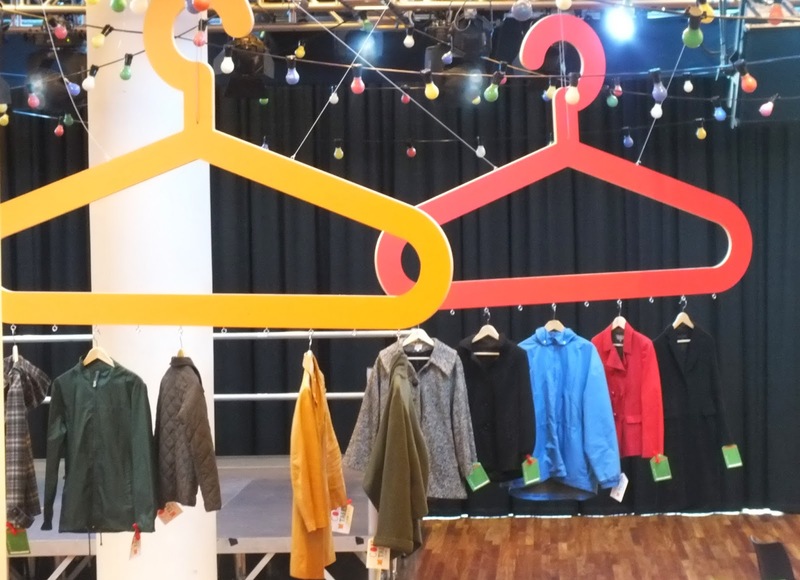 The coats – and notes – are all displayed in the Clore Ballroom of the Royal Festival Hall. It’s a surprisingly moving spectacle: a collection of disembodied jackets, macs and parkas, hanging in a space that’s reminiscent of a funky shop. But attached to them is a tiny fragment of their history, scribbled down on a piece of card. The recipient of the coats (found through Lambeth Age UK, as part of Wrapped Up 2013) will discover a piece of information about their new coat and its previous owner. This makes the process of donation feel more humane and personal, despite the fact that the coats will have come from across a vast city of millions – and possibly from different parts of the country, or even the world. 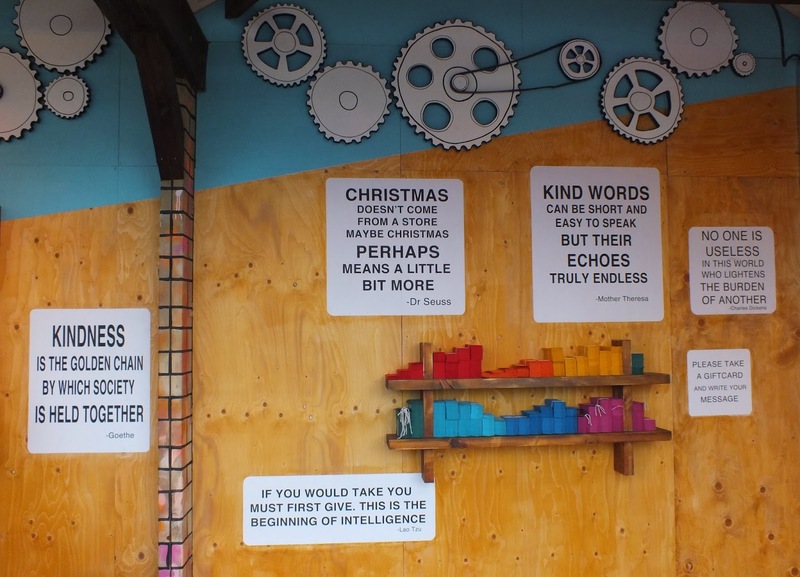 Next we visited the Natwest Gift Factory, an installation by Jo Peel, where we were greeted by stacks of rainbow-coloured card, and some uplifting quotes. 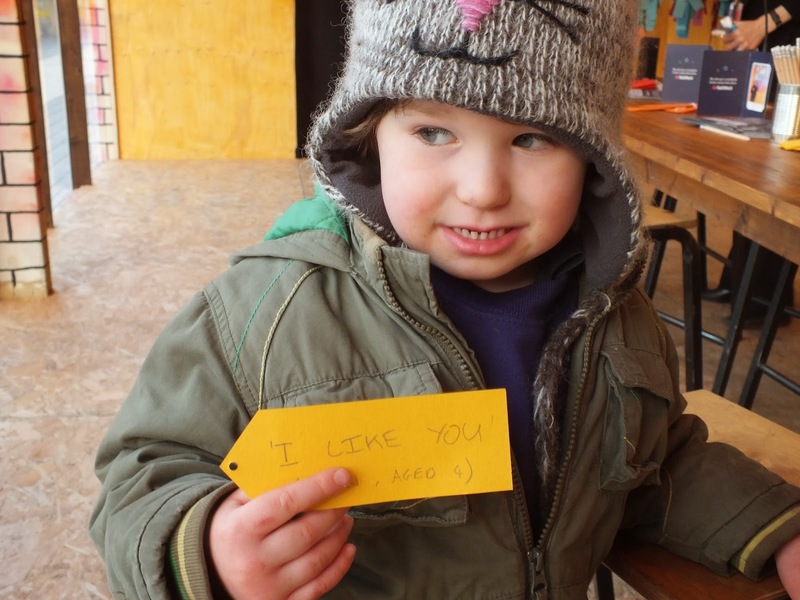 The Factory helpers asked us to write something cheering on one of the cards. 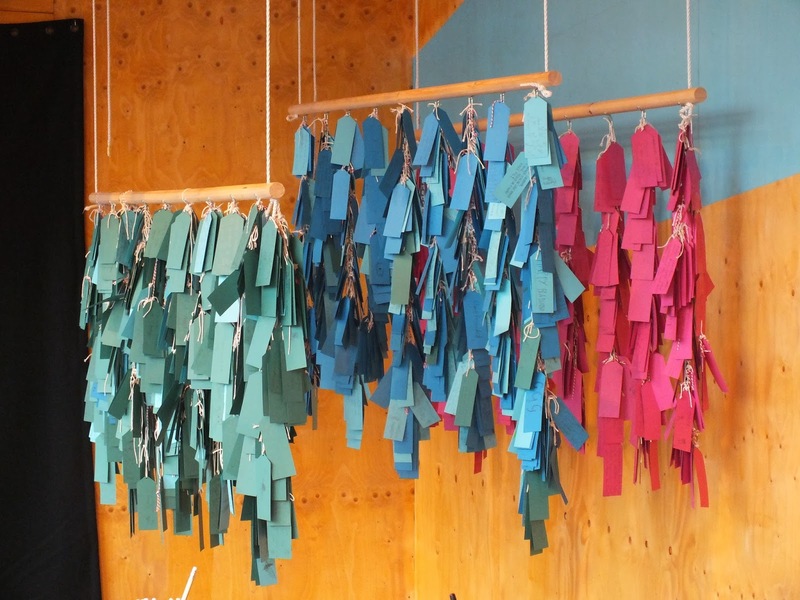 They all hang in a vibrant display, and, at the end of the season, will be passed on to children’s charity Barnardos. 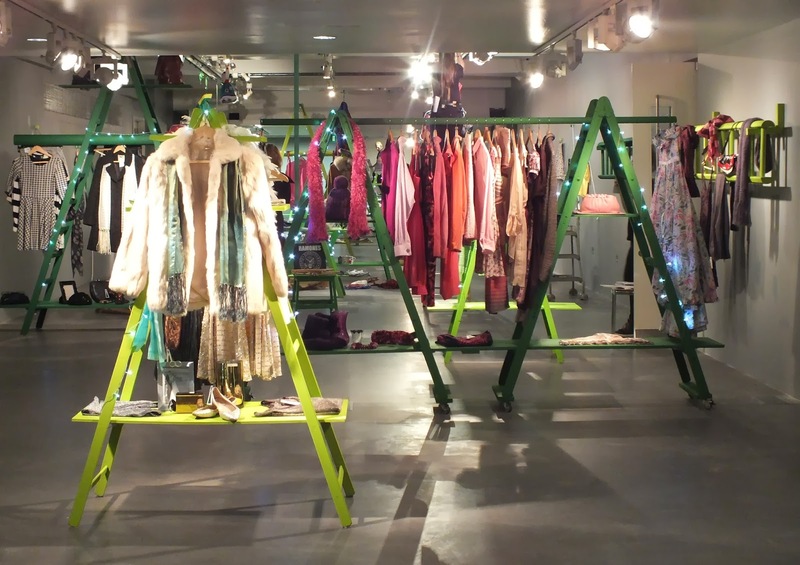 Finally, we took in the beautifully bedecked Gift of Giving, a pop-up shop for mental health charity Mind, on the Spirit Level of the Royal Festival Hall. Fitted by three interior designers from Central St Martins Art College, it sells items collected over the first twelve days of December. It was, without doubt, the most swish charity shop I’d ever set foot in (and I’ve tramped through a fair few in my time). Then, with presents bought and gifts given, it was time to head off. 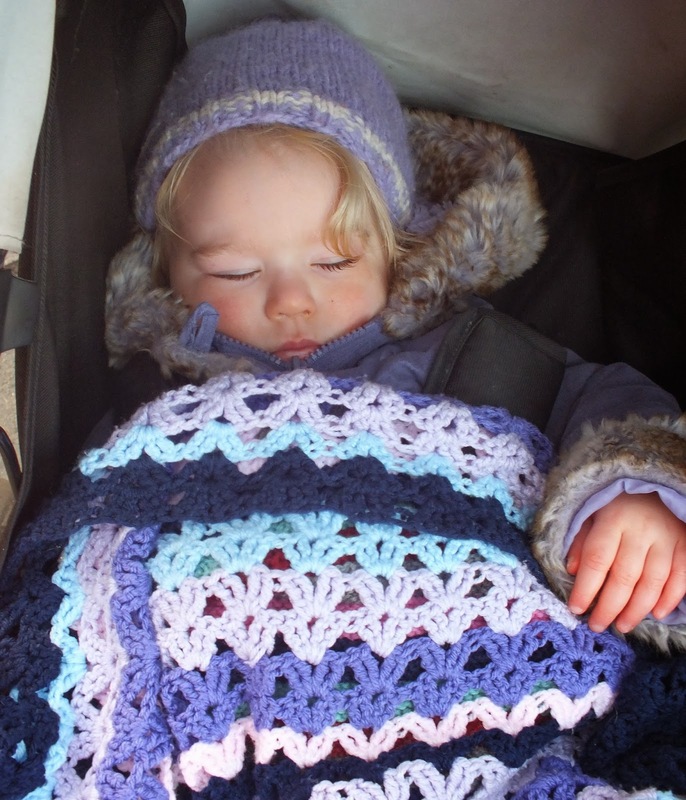 Austin was full of mince pie, and starting to clamour for Octonauts; Gwen was in the land of nod, no doubt dreaming of thrilling Christmas days to come. I wouldn’t have said it was an entirely stress-free shopping experience (with a four- and a one-year old, that would be well-nigh impossible). But, instead of arriving back home worn and frazzled, I felt a spring in my step at having given away something I knew was desperately needed. Next Post A very Merry Christmas from the Pigeon Pair and Me!